Black n' roll? Black indeed, and they roll it the Norwegian way. 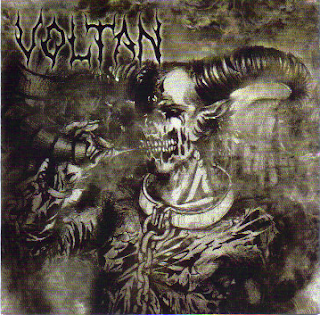 "Voltan" is a chunky four tracks of black Metal riffages obviously inseparated with the Nordic black Metal nuances. Early and mid period SATYRICON is all over and overwhelmingly hovers throughout the proceeding. But, you won't find any fast and frenetic passages here. VOLTAN keeps it laidback and dwells within the moderate, rocking paces; hence the terms 'black n' roll' is utilised, I suspect. No, they don't excruciatingly crawl like doom Metal, they keep it upbeat steadily. These combinations worked in creating an overall sense of numbing necro-ness, I hope you can still follow me up to this point though. It is by no means fast and intense musical-wise, but it resonates that grim factor much akin with black Metal of the northernmost kind. You might be listening to this sitting on a chair, but it will not let you feel comfortable. It's an unusual vibe going on here, yet from something that you feel somewhat familiar.